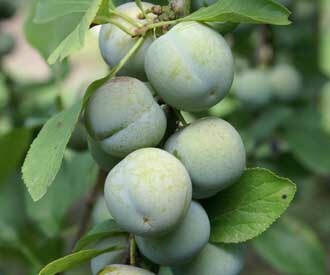 Plum and gage trees are becoming increasingly popular as garden fruit trees. 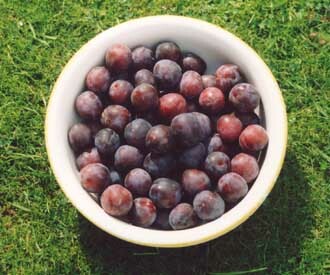 The choice of English plums and gages in shops and supermarkets can only be described as almost non-existent. The plums available are largely imported Japanese type plums which travel better and have better shelf life, but little taste. 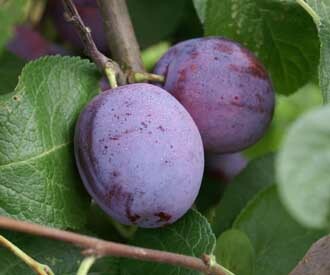 The many delicious English and European plums and gages which were once widely available are never seen. The only way you can have them is to grow them yourself. 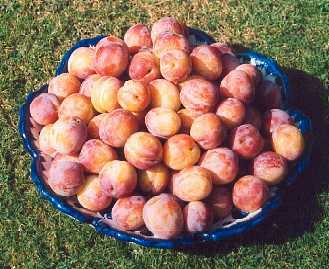 Plum trees can be grown successfully in nearly all parts of the country. They are relatively easy trees to grow needing less pruning and maintenance than apple or pear trees. 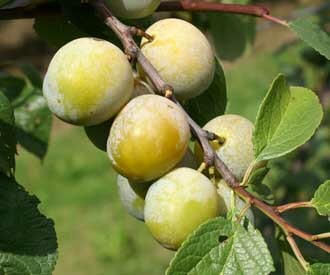 Botanically plums and gages are the same. It is simply that certain types of high quality plums – usually fairly small, very sweet with soft juicy flesh - have become known as gages. Many of the gages are of continental European origin and are known by the French name for gage Reine Claude. 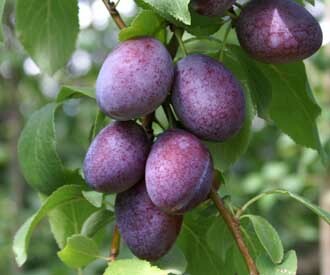 For simplicity we will therefore usually refer to all these as plums. Here at Keepers Nursery we offer over 100 varieties of plum tree for sale in any one year and we can produce many others to order. We have listed a relatively small range of the most popular and our recommended varieties. You can see the full range by clicking on the relevant links below. 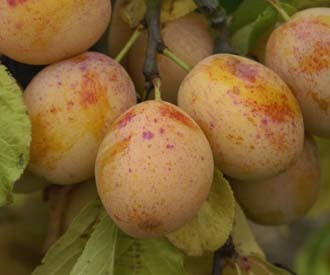 Click here for a guide to choosing plum and gage trees. 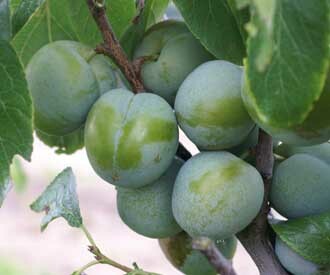 Early season plums and gages are varieties which ripen in late July and early August. Please find below 4 of the most popular and recommended varieties. We can offer a total of 9 varieties - click here. An excellent early dessert plum rather like a small Victoria. A new productive and relaiable self-fertile gage. Sweet green fruit turning slightly yellow wjen fully ripe. Please find below 7 of the most popular and recommended varieties. We can offer a total of 70 varieties - click here. 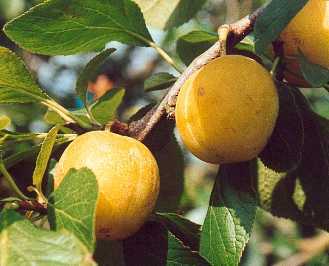 A bright yellow dessert plum with good flavour. 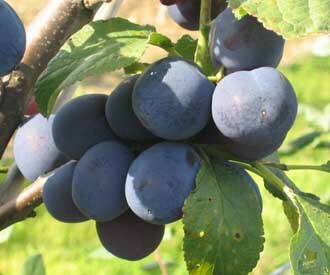 A modern plum variety similar to a Victoria but much larger fruit and slightly earlier season. 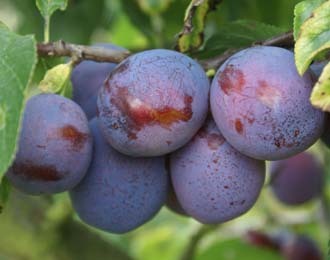 The best known and most popular of English plums. Late season plums ripen in September. 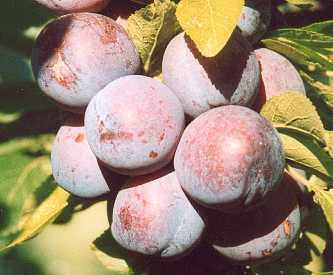 Thse varietes last longer than most on the tree and are less likely to suffer from brown rot or be damaged by wasps because of the cooler weather in September. Please find below 5 of the most popular and recommended varieties. We can offer a total of 41 varieties - click here. 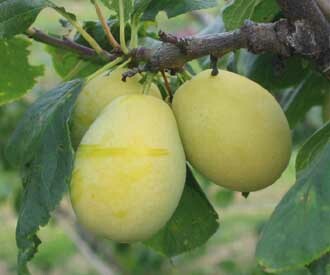 A very attractive yellow plum considered by many as the best flavoured of all plums. 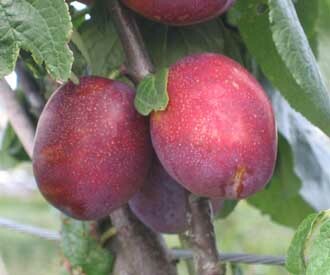 A heavy cropping red dual purpose plum similar to Victoria. An excellent late season dual purpose plum. 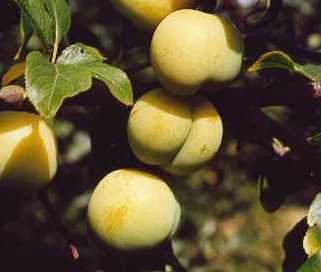 A heavy cropping late yellow plum. Attractive tree with weeping habit. 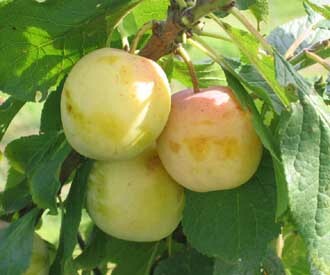 Gages are a group of high quality plums which are very sweet and have soft juicy flesh. Many varieties originate from continental Europe and have the French name for gage Reine Claude in their name. Please find below 8 of the most popular and recommended varieties. We can offer a total of 45 varieties - click here. A very sweet gage and one of the most popular of the greengages. One of the best and the most popular of the yellow gages. Self-fertile and suitable for most parts of the UK. One of the sweetest and tastiest of the greengages. 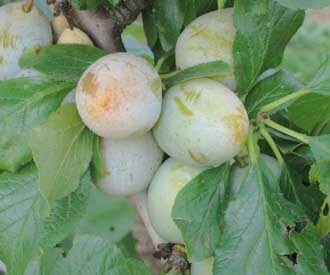 The most popular of the greengages considered by many as the finest gage. A sweet fairly large attractive yellow gage. A good garden variety for most parts of the UK. A very popular sweet yellow gage from France. 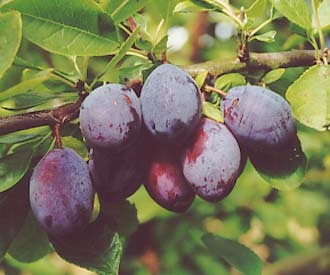 While all plums can be used for cooking there are varieties which are particularly suitable for various culinary uses. These include acid varieties which are good for jam making and varieties which are very firm fleshed and can be used for tarts or drying. Please find below 7 of the most popular and recommended varieties. We can offer a total of 72 varieties - click here. One of the most popular cooking plums. Excellent colour and flavour. One of the best culinary plums. Excellent for jam and stewing. 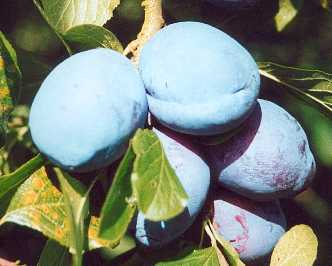 The best known of a group of very popular European plums known as Quesche in France and Zwetschen in Germany. 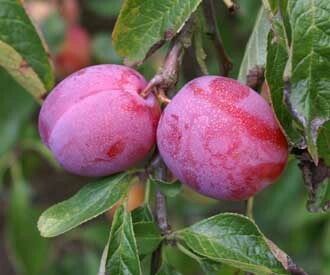 A good dual purpose plum which lives up to its name by being both early and very prolific. 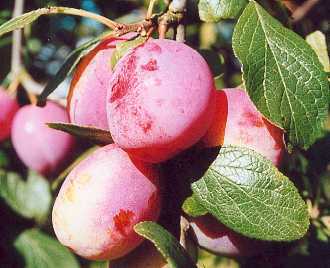 Japanese plums belong to a different but closely related species Prunus salicinia. 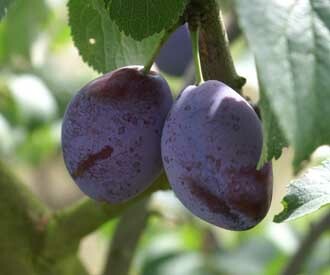 Hybrid plums are novel fruit types produced by hybridisation of plums with other stone fruit such as apricots. 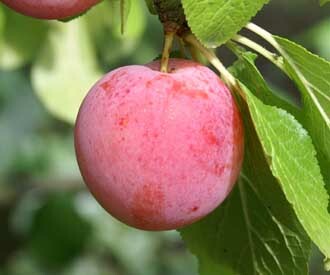 A purple pluot (cross between a Japanese plum and apricot) with an intense pear drop flavour. 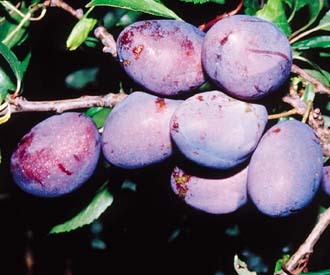 Self-fertile and partially self-fertile plum varieties do not require cross pollination from another plum variety to fertilise their flowers and produce fruit. They can be grown on their own. They may however benefit from cross pollination. Please find below 13 of the most popular and recommended varieties. We can offer a total of 59 varieties - click here. 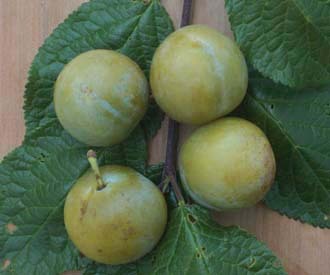 A very good late ripening self-fertile greengage widely grown in France.